L&E gear is now available from CafePress.com! 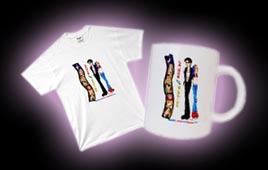 CafePress offers a dizzying number of options... mugs, mouse pads, t-shirts, baby tees, baldrics, sweatshirts, sweatshirts with three arms, doggie sweaters... whatever your size and species, you're sure to find something you can wear. We offer mugs blazoned with the ancient L&E crest. 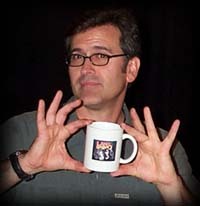 All mugs are Bruce Campbell-tested and approved. Clicking this link will also bring you to our fabulous L&E tile coasters and tin lunchbox. Just look at those products! They're glowing! They're glowing because they're so amazing! Show your allegiance to the title character of your choice by proudly displaying their image on your chest, thigh, or crotch. I love Lance! Let me buy Lance stuff! I love Eskimo! Let me buy Eskimo stuff! 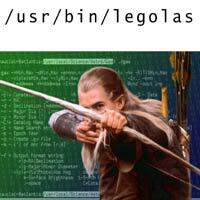 All the shirts that confuse nerds a guy could ever want. 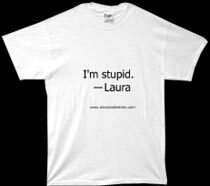 Wear this shirt in public and if Laura ever meets you, she'll cry. Guaranteed!